In my school, all of the English teachers have coined the term “Montgomery Bubble.” The term is not unfounded. We students live in a “bubble”—isolated from the outside world and frolicking in our own academic dreams. Almost the entire student body is obsessed with grades, extracurricular activities, and college. It is a society in which not going to college is a social abnormality. And so, we are oblivious of the rest of the world. The greatest literary works show extraordinary knowledge about human nature. In the Lord of the Rings Trilogy by J. R. R. Tolkien, we see an exemplification of power hungry men, driven mad by greed (i.e. Gollum or Sméagol); we see tragedy from the loss of close friends; we see a certain heroism that emerges to lead men to survival. Using plot events leading up to and comprising the war of Middle Earth, Tolkien brings out the raw nature of humanity: its despicability and conversely, its nobility. He is able to make the reader see the corruption of men and yet hints at a glimmering hope. Empathy is what evokes tears from our eyes or outbursts of laughter. While war contains enormous amounts of emotion and opportunities to be empathetic, experiencing it is not quite in this realm of possibility. In fact, we do not have to experience war (and any other events that our characters undergo) in order to be good writers. The one thing that young writers can do to empathize is to read. While reading, we unconsciously experience the emotions of other characters through exciting plots. When we staunchly support one character and absolutely hate another, this is most likely the author’s doing. The author’s understanding of his or her characters and the reader’s emotional responses paves the way for how a book is written and how the characters are molded. Thus through reading, we can experience empathy firsthand. Take, for example, Polly Wants to be a Writer by Laura Michelle Thomas. Thomas writes in the perspective of a teenage girl who can’t seem to finish a single story. By capturing the frustration that young writers feel, Thomas allows us readers to relate and sympathize. The writing process is not some simple, get-rich-quick scheme; it is a lump of clay that needs tremendous amounts of effort and molding. Likewise, emotions and character development cannot be simple clichés. I’m sure we all enjoy reading about those Mary Sue, idealized characters at times. However, the truth is, these characters don’t provide much clay to work with in the first place. In other books, such as JD Salinger’s Catcher in the Rye or Harper Lee’s To Kill a Mockingbird, the authors base the protagonists largely on themselves. Both Salinger and Holden Caulfied were exceedingly cynical of the adult world. Both Lee and Scout experienced parallel events in their lives. Many authors base characters on themselves because they understand their emotions, which provide something profound to express through words. And when we read about these characters, putting ourselves in their shoes, the author forces us to empathize. (It is also these kinds of novels that produce the best movies: actors understand empathy very well). So, when you decide to create a character, question yourself. How will this person respond to this setting and plot? How do I want the reader to perceive this character? To hate him? Love him? 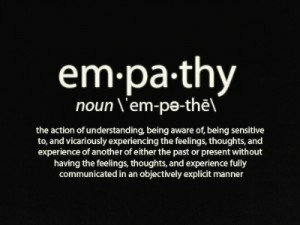 Only through empathy with your character can these emotions get through to readers.